Last week, four helicopters swept down on the Sheikh Shehzad camp for IDPs in Mardan. Their arrival was unexpected, and journalists were barred from the camp in an effort to keep the visitation under cover. One of the helicopters was transporting Richard Holbrooke, US special representative for Pakistan and Afghanistan, who was visiting displaced people in order to gain a better understanding of the humanitarian crisis unfolding here. His trip to the camps was kept hush-hush, but one media outlet managed to snag an exclusive interview with the envoy while he was mingling with IDPs – it wasn’t the BBC or VOA, Dawn or The New York Times. It was Radio Buraq, a community radio station that few people living beyond the Frontier province will have heard of. Holbrooke’s decision to grant an interview to Radio Buraq – which operates stations in Mardan, Peshawar, Abbottabad and Sialkot – indicates that he’s serious about winning the ‘information war’ against the Taliban, which he recently stated was the key to winning the war against terrorism. There are currently 150 illegal radio stations in the Frontier province and another 50 across the tribal areas. ‘FM mullahs’ use unlicensed transmitters to sermonise, promote militancy, incite young men to jihad and spread fear in villages. In April, the US announced that it would work with the Pakistan government to jam these illegal radio stations and support alternative media platforms. 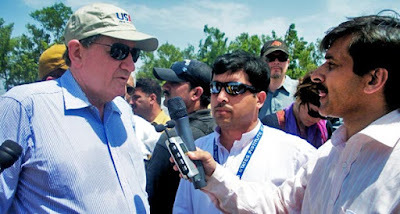 Picture: Holbrooke with Imtiaz Ali of USIP and Dr. Ashraf Ali for Radio Buraq in Mardan.